HILO » Big Island mayoral candidate Angel Pilago's come-from-behind move to second place in the race for mayor Saturday night leaves him in contention but still far behind front-runner Billy Kenoi. Eight candidates campaigned in hopes to secure a spot at the general election and to replace current mayor Harry Kim. A former mayoral aide to Mayor Harry Kim, Kenoi took 46.3 percent of the vote, compared with the 23.7 percent captured by Pilago, a councilman from Kona. 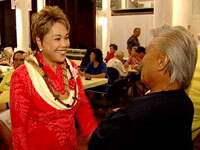 Early polls had placed Pilago behind state Sen. Lorraine Inouye, but she came in third with 20.6 percent. Kenoi was not taking his position -- just short of an outright win -- for granted. "We're going to wake up earlier. We'll work harder. We'll stay up later," he said. Pilago said months ago polls showed him in fourth place behind Kenoi, Inouye and Councilman Stacy Higa. He said his campaign has been gaining momentum and he expects to peak for the general election. He said he needs to raise more money, but will continue to refuse money from developers. Kenoi makes no such restrictions and adds that his fundraising has been successful because "people want to invest in good leadership." He added, "No one has bought me. No one buys an election." Kenoi views himself as youthful at age 39, with a law degree and experience in the county, state and federal governments. He is a former intern for U.S. Sen. Daniel Inouye. Pilago, 63, from Kona, considers himself free from "institutions," meaning established Democratic Party structures based in Hilo, although the mayor's race is nonpartisan. He criticizes "perennial and constant leaders who sometimes kept people out of the participatory process." While West Hawaii residents often feel left behind in terms of getting roads, police and fire services, and other benefits in their area, Pilago promises fairness in county spending, meaning not that Kona would get more but that every district would be re-evaluated in terms of its needs. Kenoi says he wrote the legal complaint that resulted in the stopping of a controversial spaceport proposal in 1994 and has done work for the Native Hawaiian Legal Corp. to protect Hawaiian rights.